Just three days after the bombing of Nagaski, on August 12, 1945, General Leslie Groves released an “administrative history of the Atomic Bomb project and the basic scientific knowledge on which the several developments were based.” It was known as the Smyth Report, after its author, Professor Henry DeWolf Smyth. Smyth taught Physics at Princeton before and after his stint at Los Alamos. The report’s official title was A General Account of the Development of Methods of Using Atomic Energy for Military Purposes Under the Auspices of the United States Government, 1940-1945. It was sold by the Superintendent of Documents. Bob Rochlin, an outstanding public servant who worked at ACDA for many years, gifted me his copy, which cost him thirty-five cents. It was conceivable that a few uranium bombs might be decisive in winning the war for the side putting them into use. Such thoughts were very much in the minds of those working in this field, but the attainment of a slow-neutron chain reaction seemed a necessary preliminary step in convincing military authorities and the more skeptical scientists that the whole notion was not a pipe dream. A weapon has been developed that is potentially destructive beyond the wildest nightmares of the imagination; a weapon so ideally suited to sudden unannounced attack that a country’s major cities might be destroyed overnight by an ostensibly friendly power. This weapon has been created not by the devilish inspiration of some warped genius but by the arduous labor of thousands of normal men and women working for the safety of their country. My thoughts exactly! Cover design, not contents. 1. It’s a VERY odd document. There is nothing else comparable that I can think of. A big state produces a brand new, game-changing weapon (the atomic bomb), and then, nearly simultaneous with its first use, releases a technical history of said weapon. They didn’t do this with the H-bomb (though they did in fact consider doing such a thing — I am working on an article about this at the moment), they didn’t do this with ICBMs, they didn’t do this before or after or since. They did do similar things with technology that was quickly declassified (such as radar), but the bomb was certainly not that. decisions such as this. Then, after a pause: “You will release the report; the meeting is adjourned.” I love the anti-climatic nature of the final decision — after literally months of hemming and hawing about it by Groves, Bush, Conant, the British, etc., Truman just decided to have out with it. 3. Why have the report in the first place? The Bush and Conant reason for it was primarily about empowering citizens and policymakers with the understanding about what the bomb was and how it was made. They felt that it was really essential that basic technical information be diffused in a way that would allow decisions to be made about, say, postwar plans for controlling the bomb, or understanding the connection between basic nuclear research and the new technology. Groves, though, was more security-minded: for him, releasing the Smyth Report would set the limits on what could be said, and give credit to the scientists and industrialists who participated. If he gave out credit, he felt, then others would be less prone to try and take it by themselves. If people were trying to claim credit, they might divulge secrets. If people didn’t know what the limits of classification were — what the “official story” was — then they might slip up and talk about things they weren’t supposed to. So for Groves, giving out a whole heap of information was the way towards constraining the great bulk of the stuff that was still secret. This connection between releasing secrets and keeping them runs throughout the history of US nuclear secrecy, in fact, but it started with Groves, interestingly enough, given his reputation as a secret-keeper. 4. Rebecca Press Schwartz wrote an interesting dissertation at Princeton a couple of years ago arguing that one of the reasons that people think that the bomb is a product of physics, as opposed to chemistry, metallurgy, and engineering, is because of the biases inherent to the Smyth Report. We know today that you need a lot more than theoretical physics to make a bomb, but still we consider the theoretical physics to be the most important aspect. Rebecca argues persuasively that the Smyth Report focuses on theoretical physics primarily for two reasons: 1. Smyth, a physicist, though the physics was the most interesting and more important aspect, and thus emphasized it for that reason, and 2., most importantly, the theoretical physics of the bomb was the material that was most easily declassifiable in 1945, because a great majority of it derived from work that had been done before the war. The chemistry, metallurgy, and engineering were all much newer and much more classified, so they don’t appear in the Smyth Report at all. Of course, that means that in the public eye they were LESS important, because they appeared to be ignored. So there’s another nice aspect of secrecy irony in there: we give attention to the things which have been released, but the fact that they are released may mean that they are not very important! 5. 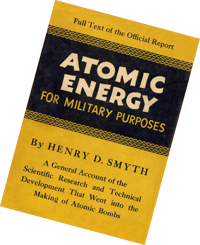 Lastly, and my favorite little tidbit, the Smyth Report was NOT supposed to be titled “A General Account of the Development of Methods of Using Atomic Energy for Military Purposes,” as it was in fact actually released. It was supposed to be titled just “Atomic Bombs,” and the “General Account…” was meant to be the sub-title. The thing was, Groves was so paranoid about it leaking out that he wanted the actual title to be applied just before it got released, with a stamp. But in the activity after the bombings of Hiroshima and Nagasaki, nobody remembered to actually perform the final stamping, and so “A General Account…” it was. I could go on all day about the Smyth Report, and have gone on too far already for a blog comment, but it’s really a fascinating historical document and a very telling historical episode. There is some interesting discussion of it in Michael Gordin’s “Red Cloud at Dawn,” chapter 3, about how useful it would have been to the Soviets (more useful than one might think — not in details, but in its information on how to organize a Manhattan Project-sized effort), as well. I’m not sure how useful it would have been to the Soviets given all the espionage they had running into the Manhattan Project. I don’t own a copy of “Red Cloud at Dawn”, and don’t recall the specific comments there, but that strikes me as an odd assertion. George: Specifically, what the Smyth Report gives you is an idea of exactly the research priorities, the relative sizes of the production plants, estimates as to their relative outputs, and some indications of which methods were more productive than others (in particular that gaseous diffusion could be made to work). he espionage gives you a more fine-grained look. Even Fuchs, who probably knew the most, would have only given you the design for the Fat Man bomb, experiments they did regarding critical masses and other technical details, and the general layout of the gaseous diffusion plant. That’s pretty useful information, and not to be discounted. But the really difficult part of the Manhattan Project for the Americans was deciding what paths to follow, what facilities to build, what money to spend. The Smyth Report takes all of the ambiguity out of that: it makes it clear what works, what doesn’t, what path to follow, as Szilard put it, if you want to end up with a bomb yourself. A well written insider account puts things together in a way that a mountain of haphazard leaks cannot. But the main thing to remember is that the espionage data was extremely tightly controlled – for the most part Beria and Kurchatov only saw it, or even knew of its existence. The Smyth report was public and could be given to everybody – and was. Last I checked the copy on the shelf on the UCLA Physics Library is one of the original copies issued in August 1945. You can read the book for free at Google Scholar. Really great post. The conventional wisdom I have heard many times is that, with the release of the report, enrichment technology was released to all and sundry. Two questions: is the above statement true? ; and how much did the report govern information that was declassified subsequently? The report lacks the kind of technical information that would actually allow anyone to build the enrichment methods described in it. It contains what a physicist would consider to be a most basic conceptual descriptions of the electromagnetic and gaseous diffusion methods, general discussions of what problems had to be surmounted (e.g. the manufacture of an adequate barrier for diffusion), and even briefer discussions of other methods (e.g. thermal diffusion and centrifuges). Most importantly, it says that electromagnetic works but implies it is not very efficient, and that gaseous diffusion can work. That’s useful information if you’re trying to figure out what kind of plant to start researching. As for declassification: Everything in the Smyth Report was considered to be declassified as of its publication. The criteria for what could be included in the report were drawn up by General Groves, Henry Smyth, and Richard Tolman, a Caltech physicist who advised Groves. Put simply, the criteria was that nothing could go in the Report unless it was immediately inferable to a trained physicist from the fact that the bombs had worked, or could be discovered in a very short amount of time by a very small team of researchers. Groves had hoped that the Smyth Report would serve as sufficient declassification until Congress passed postwar legislation that would leave the thorny problem of the “secrets” to whomever was going to succeed him. However by early November 1945, it became clear that this was not going to happen quickly, and that there were pressures from a variety of sides to start systematically declassifying Manhattan Project technical information. Groves appointed Tolman the chairman of a Committee on Declassification, along with Robert Oppenheimer, Ernest Lawrence, Arthur Compton, Harold Urey, Robert Bacher, and Frank Spedding. The Committee on Declassification met in late 1945 and early 1946 and hammered out the first coherent plan for a declassification system for Manhattan Project data, based largely on ideas by Oppenheimer (who was simultaneously serving on the Acheson-Lilienthal Committee, which was itself trying to reframe the problem of the bomb away from secrecy). Their plan is by modern standards pretty straightforward: 1. create categories of technical data based on how sensitive it is, 2. come up with criteria for determining whether something should be released or not, 3. create classification “guides” that tell “responsible reviewers” what to declassify, 4. require everyone who knows secret information to submit things to the “responsible reviewers” before they publish it, and 5. meet regularly to see if the guides need to be updated as world circumstances change and the state of the art changes. Seems obvious today, but they were really just making it up from first principles at the time. The plan the Committee came up with was approved by Groves and became the basis for the Manhattan Engineer District Declassification Organization, which itself later became the basis for the Atomic Energy Commission’s declassification policies. So, in a nutshell: it had a big influence, as it was a huge “chunk” of declassification that happened all at once. But it wasn’t a “system” of declassification — that had to be developed a bit later. Backing up what Alex said, David Holloway wrote in his book “Stalin and the Bomb” that although the report was unclassified, Soviet scientists nonetheless found it useful. A Russian translation of 30,000 copies was published in early 1946. Together with information obtained from its spies, the report helped guide subsequent Soviet technical decisions by explaining what general processes the United States had used to manufacture nuclear materials (and perhaps just as important, which ones didn’t pan out). During one of his first briefings by the AEC, President-elect Eisenhower complained that the report had given away too much information on the Manhattan Project, such as the locations of production plants. Jeffrey: I remember when you bought that copy! He also notes that the Russians emphasized parts that they thought were important, and in fact were important, more so than was in the original American edition. So while I think one can say, “here’s how it helped,” I think it’s hard to pose the counter-factual of “what would have happened without it” with any confidence. Notwithstanding the Smyth report and espionage, the Soviet atomic bomb effort actually took _longer_ than the Manhattan Project. It is interesting to observe that the first atomic bomb project remains the fastest – despite 9 others actually building bombs and a dozen or more (depending on your counting criteria) that made a serious attempt. I forgot to second your praise of Bob Rochlin. He was something of a mentor to me in the late 70’s, early 80’s, when ACDA still existed and he was surrounded by lots of folks who had great insights for a twenty-something trying to figure out this arms control thing. Still trying to figure it out of course; kudos to you and others for keeping this thing going. Thank you for this post and the subsequent comments, which are a very interesting read. Could Arms Control Wonk perhaps set up a dedicated part of the site to facilitate access to useful (older) documents that are hard to find? Mention of Vannevar Bush reminds me that I have been trying to get a copy of the book “Modern Arms & Free men: A discussion of the role of science in preserving democracy” from 1949. Any ideas where I might find that online? Let me know if you will be coming to Carnegie’s nuke fest. The Smyth Report is the product of an America which had not yet become a nation where it was thought the government had the right to spend huge amounts of money and run nation-changing activities in total secrecy. In a very real way it shows how dramatically America was to change in the decade following it’s release. Also, there was the CYA factor, if the bomb didn’t work, Groves et al wanted their case for due diligence and heroic effort public before the investigations began. Ironically, the openness of Smyth Report may have sealed the secrecy of future projects: it was a glowing testament to the value, necessity, and effectiveness of massive, secret government projects. It solidified the atomic bomb as the ultimate example of the connection between basic science, massive industrialized facilities, and wonder weapons. The prevailing sentiment regarding the Smyth Report in the years of 1946-1947 was one of condemnation: scientists like Szilard said that it had released all secrets, administrators like Lilienthal said it indicated how sloppy the Army was with secrets, and a good number of people in power indicated that they wished it had never been published. The positions of Szilard and Lilienthal were of course politically motivated: Szilard wanted to argue that there were no secrets, thus no need for future secrecy; Lilienthal wanted to emphasize that the civilian/military distinction in terms of secret-keeping was a false dichotomy. But the final result was, again, that nothing like the Smyth Report would ever again be released. @Ian — Try Abebooks or Alibris. Both are really great for ex libris editions of books like that. Abebooks has over a dozen copies of _Modern Arms and Free Men_ for under $4. I’m new to this blog and was invited by Carey Sublette after a recent and similar discussion regarding open discussions of scientific information that relates to nuclear weapons and technology. Perhaps I missed this point somewhere in the posts but it would be interesting to see the effect of open source information, reconstructed information such as “Swords of Armageddon” or classification leaks on proliferation. One of the other ACW staff wrote something to the effect that the science is understood but the engineering aspects are the greatest challenge. After Reading Richard Rhodes’ most recent book that appears to be true. He writes that the Iraqis began a crash program to build a nuclear weapon using their stockpile of Uranium. They were unable to complete the device do to numerous hands-on engineering challenges. Considering the expansion of information available on the internet compared to what was available in 1990, could we see accelerated nuclear programs? Worse yet, could we be providing one of the essential tools to a lesser sophisticated enemy? The Iraqis had the scientific knowledge, material, infrastructure and political will but not the engineering or hands-on understanding. Furthermore, the implosion design that Rhodes shows that they were pursuing was a solid pack that couldn’t be used on a missile. Information proliferation regarding smaller and simpler designs may have been quite useful to Saddam’s efforts. This may have been true for a while, and in response to the Osirak attack — not before and not for long after. …..the Osirak reactor that was bombed by Israel in June of 1981 was explicitly designed by the French engineer Yves Girard to be unsuitable for making bombs. That was obvious to me on my 1982 visit. Many physicists and nuclear engineers have agreed. Much evidence suggests that the bombing did not delay the Iraqi nuclear-weapons program but started it. For example, the principal Iraqi scientist, Jafar Dhia Jafar, was asked by Saddam Hussein to work on the bomb only in July of 1981. Second, Fallows fails to recognize that Iran is now in compliance with the Nuclear Non-Proliferation Treaty, after having failed to provide details of the uranium-enrichment program when it should have. The protocol Iran has declined to sign is an additional protocol that is not a part of the treaty itself. More important, the principal proponent of the treaty, the United States, has been in violation of the treaty almost continuously since its inception. The United States is continuing to develop new types of nuclear weapons and failing to disarm to the extent most scientists believe is desirable. The United States has refused to sign the test-ban treaty. The United States is also violating Title VI by failing to help non-weapons states use nuclear energy for peaceful purposes, such as electricity production. James Fallows and the U.S. State Department may not understand these matters, but any non-nuclear state that feels threatened by a neighbor or by the United States certainly does. Rhetoric about failing to follow the NPT is rightly perceived as insulting. If we wish to dissuade Iran from making nuclear weapons, then we must somehow find a peaceful way to persuade the Iranians that not making such weapons is in their interest and not merely in ours. We must recognize their sovereign rights and their legitimate pride. The threat of bombing is not enough, and is probably counterproductive. The Iraqis didn’t have fissile material for a bomb, which is the main thing. Keep gas centrifuge technology out of the hands of proliferators and you’re pretty safe. If not, then you’ve lost anyway, since all the other bomb requirements are easier to come by. Personally, I think a one-sided approach to public domain information (did it help someone do something bad?) doesn’t really take into account the complexity of the declassification decision, which is a balancing act between potentially helping an adversary and the benefit derived from having it be open. You end up with very skewed results — of course the Smyth Report helped, one way or another. On the other hand, would not having published it really have hindered the potential proliferator? And would it have had an adverse effect on, say, the deliberations about the Atomic Energy Act or the Acheson-Lilienthal Report, for the U.S. to have tried to withheld the information? Bush, Conant, and Groves were all well aware that the Smyth Report would help the Soviets with some things. But they felt (each for their own reasons) that the benefits for release would be large, and that holding back the information would not provide measurable benefits (it would delay the Russians a few months at most). I tend to agree. Sadly, that is contrary to the NPT. I suggest the West design a treaty whose letter and spirit they are comfortable abiding by, instead of torturing the NPT. Back in 2005, when the west assessed that Iran did have an active nuclear weapons programme, the National Defense University in Washington DC examined its motivations. The NDU study concluded that Iran desired nuclear weapons mainly because it felt strategically isolated and that “possession of such weapons would give the regime legitimacy, respectability, and protection”. In other words, Iran desired nuclear weapons for the dual purposes of pride and deterrence, just like every other nuclear-armed nation. The NDU study judged “and nearly all experts consulted agree, that Iran would not, as a matter of state policy, give up its control of such weapons to terrorist organisations and risk direct US or Israeli retribution”; and, finally, that the “United States has options short of war that it could employ to deter a nuclear-armed Iran and dissuade further proliferation” (see http://www.ndu.edu/inss/docUploaded/McNair70.pdf ). As it happens, the latest US National Intelligence Estimate, from 2007, indicates that Iran suspended its nuclear weapons programme in 2003. Let’s remember that Argentina, Brazil, China, France, Germany, India, Japan, the Netherlands, Pakistan, Russia, the UK and the US all enrich uranium legally just like Iran. (Further, Israel and North Korea are suspected of having similar enrichment programmes). The NPT contains not a single word suggesting any right to gas centrifuge technology, or any particular enrichment technology. You could reasonably read it as containing a right to buy LEU for reactors at commercial prices, provided the reactors are for peaceful use. Yes, well, no one blinks when Argentina and Brazil enrich U without the Additional Protocol so there is plenty of precedent. According to Rhodes, Iraq had approximately 17Kg of HEU in storage for a new Russian built reactor and Saddam asked his scientists to design a nuclear weapon for that material only 8 months prior to the coalition invasion. Agreed, the Iranian efforts will require a very different diplomatic approach due to their culture. The carrot and the stick may not work any better with them than it did with Saddam. His need to maintain credibility in the Arab world through a nuclear program facade led to his downfall. Iran will not simply cower to threats of military action. Maintaining control of the technical information needed for weapon engineering and enrichment is essential. Equally important are physical security and international cooperation. The question remains, what part do we citizens play in proliferation in the information age with tools like WikiLeaks? There is a tremendous amount of technical information available for anyone to access anonymously. True, that putative 17kG came about due to the start of the Iraqi nuclear weapons program, in turn brought about by the Osirak attack. OK, my other comment did not survive moderation so let’s try another tack: is there a source for the 17 kG HEU story? And even if the putative 17 kG HEU was there it was, as the Professor from Harvard describes above in his letter, likely a result of the nuclear weapons program which was started in Iraq as a result of the Israeli attack on Osirak. Stocks of fresh unirradiated fuel used for the Soviet IRT 5000 reactor were of vital concern. Efforts began to locate 68 fuel assemblies of 80% enrichment with a U235 content of 10.97 kilograms and 10 assemblies of 36% enrichment with a U235 content of 1.27 kilograms. In addition, there was a set of fresh fuel plates for the French Tammuz-2 reactor with an enrichment of 93% and a total U235 content of 372 grams. This adds up to a little over 17 kgs. by David Albright, Frans Berkhout and William Walker. According to the text on pages 345 and 346 the program to extract HEU from the fuel cells would have produced enough HEU for a bomb in a year or so, maybe, plus maybe a little extra HEU. Iraq had effectively no fissile material at the time of the first Gulf war. Could you kindly clarify the point you are trying to make with this information? Did we retroactively find the WMD that justified the Iraq war? “If the government agrees, we need to have the ability in the future to develop a nuclear weapon,” said Gen. Jose Benedito de Barros Moreira, one of Brazil’s few four-star generals and a former head of the country’s War College. Barros Moreira, who is presently a senior official in Brazil’s Ministry of Defense, in charge of formulating the country’s military strategy, compared the weapon to a “lock” needed to safeguard Brazil’s resources. “BRASILIA, Brazil — Brazil’s vice president says in an interview published Friday that his country should develop nuclear weapons. Other officials stressed that his comments were not government policy. “The nuclear weapon, used as an instrument of deterrence, is of great importance for a country that has 15,000 kilometers of border to the west and a territorial sea” where oil reserves have been found, Alencar said. Mark has written on the Resende Fuel Processing Complex so maybe he can tell us more. But former U.N. inspector Albright said he worked with Goncalves at the Brazilian Physics Society on a project to show that the Brazilian centrifuges could be used to produce highly enriched uranium, even if that wasn’t their intended use. I wonder why there are not more press releases from ISIS re. Brazil? Where are the zealous reports by Sanger and Broad on Brazil? In my view, that a fuss has not been rasped about Brazil only indicates the lack of even-handedness of which the NAM countries (rightly) complain. Brazil is not perceived as a threat to the West/UNSC so there is little pressure put upon the IAEA to investigate it as zealously as the IAEA is pressured to investigate Iran. If anything, judging by the statements of their officials one ought to be more concerned with Brazil than with Iran, although in neither case do I think are the nations actually diverting nuclear material for improper uses.